Light camouflage gives us the chance to see plenty of new features and get a better idea of overall size. GM must be getting close to revealing their premium sedan as they shed the heavy cammo while testing the next-gen 2014 Cadillac CTS in Europe. To throw us off the scent, GM engineers applied sticker camouflage to the rear glass to give the sedan a coupe-like appearance. However, we&apos;re more interested in what&apos;s going on underneath. The CTS Mk3 is in for some big changes, as it moves from the Sigma II platform to a stretched version of GM&apos;s RWD &apos;Alpha&apos; platform underpinning the ATS. This should help it compete directly with the BMW 5-Series, Audi A6, Lexus GS and Mercedes E-Class models. From the spy shots we can see the new CTS has grown in length and possibly in width too while the angular look of Cadillac&apos;s Art and Science design theme has also been applied. In addition to getting a pretty good peek at the grille, which sports a V-patterned design, other visible features include LED daytime running lights, a large pair of rectangular chrome exhaust tips, front & rear radar senses, and Brembo brakes. While we were initially hopeful this might be a CTS-V prototype, the rear brakes look too small and there are no distinctive V-series design cues. For the entry-level model, the 2014 CTS should inherit the 270hp, 2.0L turbocharged four-cylinder from the ATS, marking the first time the CTS has featured four-cylinder power. The upmarket CTS will likely continue to feature a 3.6L V6, while the next-gen CTS-V is rumored to be inheriting a version of the C7 Corvette&apos;s V8. 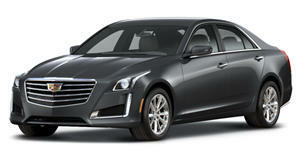 Watch for production of the new CTS to start at the Lansing Grand River Assembly plant in September 2013.